We are situated in Hanwell, between Boston Manor Road and Northfields Avenue, south of the Uxbridge Road. There are parking restrictions Mon - Fri 9-10am and 2-3pm. If you need a permit during this time please inform your therapist when you arrive. There are no parking restrictions at other times. Please phone the number above during working hours to make an appointment. Our reception service will be happy to book your session. 10 min. walk from Boston Manor Tube Station. 15 min. walk from Northfields Tube Station. In a recent systematic review of global research about disability and disease, researchers found that lower back pain is responsible for more disability than any other condition and expect the problem to get worse because of an ageing population. Although this study focused on the lower back, generalized back pain presents the same problem globally, and for UK residents. In fact, the National Health Service (NHS) reports that back pain is the largest cause of disability in the UK and those with lower back pain account for 11 percent of the disabled population. If you are experiencing back pain, you might feel helpless, but it doesn't have to be that way. After discussing some common causes of back pain, an overview of exercises that you can perform to relieve lower back pain at home and at the gym will guide you towards a path of healing, recovery and relief. • Sprains and strains cause most back pain. Whether someone overstretches a ligament or tears a tendon or muscle, the result can be debilitating. Either situation might occur from improper lifting, heavy lifting, or overstretching. • Disc degeneration occurs with ageing. Discs provide height and allow people to bend, flex, and twist the lower back. As one gets older, their discs lose their cushion. • Slipped discs, sometimes referred to as herniated discs, occur when the soft tissue between vertebrae push out. • Radiculopathy refers to pressure on a nerve's root that causes pain or numbness and travels to other parts of the body through nerve pathways. Compression or injury might cause radiculopathy. • Sciatica is the most common form of radiculopathy and occurs when something compresses the sciatic nerve, the large nerve that travels down one's backside and leg. A tumour might cause sciatica, as well as any other condition that compresses the root of the sciatic nerve. • Accidents and traumas that might occur from a car accident, playing sports or a fall might lead to any of the above items, causing lower back pain. Lie on your back with a flat pillow or book under your head. Bend your knees and keep them together. Relax your upper body and tuck your chin as you roll your knees from side to side while keeping both shoulders on the floor. If it's more comfortable for you, put your hands under your head. Hold the stretch for about ten seconds and return to the starting position. Do four to five repetitions on each side. Lie on your front and rest on your forearms while bending your elbows at your sides. Look at the floor and take care not to bend your neck back while you arch your back and push down on your hands. Repeat eight to ten times, holding each repetition for five to ten seconds. Make sure to keep your neck straight and focus on your breathing. Lie on your back with a small pillow, cushion, or book under your head. Bend your knees as you keep your feet pointed straight and even with your hips. Keep your chin tucked as you contract your stomach muscles and tilt your pelvis toward your heels until you feel an arch in your back. Take care not to press down through your neck, shoulders, or feet. If you are doing the pelvic tilt correctly, you will feel your stomach and lower back muscles working. Repeat the pelvic tilt 10 to 15 times. While you are still on your back from the pelvic tilt, keep your knees bent and about hip-width apart. Bring one knee up and pull it gently into your chest. Hold for five seconds as you feel the stretch. Repeat five times on each knee. Lie on your back while supporting your head with a small pillow or cushion. Bend your knees in the same way that you would for the pelvic tilt or knees to chest exercise. Try to relax your upper body and tuck your chin. Take a deep breath in and as you exhale, gently and slowly tense the muscles in your pelvis and stomach so you are pulling them towards your chest. Hold for at least five seconds, but try for 10 and then release. Repeat five times. You may think that lunges only work your legs, thighs and buttocks, but your back muscles act to stabilize your body when performing them, making lunges a great way to build up the strength in your core. For the best results do deep lunges while you kneel on one knee with the other foot in front. Lift the back knee up and hold for five seconds. Start with three on each side. Make sure that your front knee does not overextend by trying to keep it even with your toes. If you don't want to exercise at home or don't like doing solo activities at the gym, consider a group fitness class. Any kind of stretching or strengthening classes will help reduce your back pain if you go regularly. Try beginning yoga or Pilates for an all over workout that will help stretch and strengthen your core and begin to give you relief from your back pain. 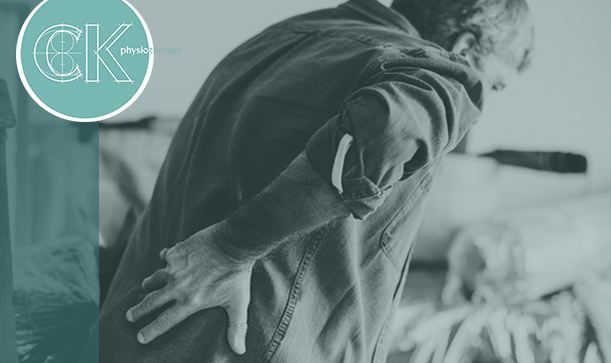 Contact us at CK Physiotherapy with questions about relieving your lower back pain or to book an appointment for an initial assessment and treatment. More People are Suffering from Back Pain: How to Solve It?